Chrome vanadium steel blade ensures greater hardness, strength, and durability. Satin chrome plated blade with magnetic tip. Soft cushion grip provides greater comfort and control. Chrome vanadium steel blade ensures greater hardness, strength, and durability. Satin chrome plated blade with magnetic tip. Soft cushion grip provides greater comfort and control. Thumb stop allows for added torque. Chrome vanadium steel blade. Chrome plated blade with magnetic tip. Line color transparent handle. Standard, fluted blade is made of alloy steel for long life with hardened tips that are slip resistant. Ergonomically designed handle for comfortable grip. Chrome vanadium steel blade. Chrome plated blade with magnetic tip. Line color transparent handle. Standard, fluted blade is made of alloy steel for long life with hardened tips that are slip resistant. Ergonomically designed handle for comfortable grip. Chrome vanadium steel blade ensures greater hardness, strength, and durability. Satin chrome plated blade with magnetic tip. Soft cushion grip provides greater comfort and control. Chrome vanadium steel blade ensures greater hardness, strength, and durability. Satin chrome plated blade with magnetic tip. Soft cushion grip provides greater comfort and control. Thumb stop allows for added torque. Chrome vanadium steel blade ensures greater hardness, strength, and durability. Satin chrome plated blade with magnetic tip. Soft cushion grip provides greater comfort and control. Thumb stop allows for added torque. 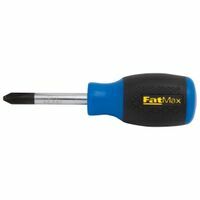 FatMax Screwdriver, Series: 62 Series, NO 0 Point, Phillips Stubby Point, 5-1/2 in Overall Length, 2-3/8 in Shank Length, 1/8 in Blade Diameter, Ergonomic Tri-Lobular Handle FatMax Screwdriver, Series: 62 Series, NO 2 Point, Phillips Stubby Point, 4 in Overall Length, 1-3/4 in Shank Length, 1/4 in Blade Diameter, Ergonomic Tri-Lobular Handle Chrome vanadium steel blade ensures greater hardness, strength, and durability. Satin chrome plated blade with magnetic tip. Soft cushion grip provides greater comfort and control. 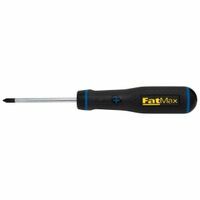 FatMax Screwdriver, Series: 62 Series, NO 1 Point, Phillips Stubby Point, 7-1/2 in Overall Length, 3 in Shank Length, 3/16 in Blade Diameter, Ergonomic Tri-Lobular Handle Round tool steel shaft for strength and durability with bright zinc plated blade to prevent corrosion. Ergonomic, high efficiency, high torque handle with a cushioned rubber cover for comfort and slippage control. High strength nylon handle core over-molded onto bar for more torque handling and impact resistance. Heat treated, sand blasted tip, lacquer coated bar resists rust and resists slip out. Ergonomic tri-lobular handle with slip-resistant rubber grip. Tip identification symbol molded onto side handle. Carded. Chrome vanadium steel blade ensures greater hardness, strength, and durability. Satin chrome plated blade with magnetic tip. Soft cushion grip provides greater comfort and control. Thumb stop allows for added torque. Stanley Screwdriver, Series: 62 Series, NO 3 Point, Phillips Stubby Point, 11 in Overall Length, 6 in Shank Length, 5/16 in Blade Diameter, Ergonomic Tri-Lobular Handle Black oxide tips provide corrosion resistance and precise fit. Full size vinyl grip handle. Black oxide tips provide corrosion resistance and precise fit. Full size vinyl grip handle. Tip is precision-machined to provide better fit and torque without slippage; cushion-grip handle for greater comfort; premium chrome-plated for smooth feel and corrosion resistance; internal flanges inside handle provide solid, twist-resistant blade anchor; special heat-treated shafts for longer life; "Tip-Ident" quickly identifies the screwdriver type and tip orientation. Tip is precision-machined to provide better fit and torque without slippage; cushion-grip handle for greater comfort; premium chrome-plated for smooth feel and corrosion resistance; internal flanges inside handle provide solid, twist-resistant blade anchor; special heat-treated shafts for longer life; "Tip-Ident" quickly identifies the screwdriver type and tip orientation. Tip is precision-machined to provide better fit and torque without slippage; cushion-grip handle for greater comfort; premium chrome-plated for smooth feel and corrosion resistance; internal flanges inside handle provide solid, twist-resistant blade anchor; special heat-treated shafts for longer life; "Tip-Ident" quickly identifies the screwdriver type and tip orientation. Black oxide tips provide corrosion resistance and precise fit. Full size vinyl grip handle. Tip is precision-machined to provide better fit and torque without slippage; cushion-grip handle for greater comfort; premium chrome-plated for smooth feel and corrosion resistance; internal flanges inside handle provide solid, twist-resistant blade anchor; special heat-treated shafts for longer life; "Tip-Ident" quickly identifies the screwdriver type and tip orientation. Tip is precision-machined to provide better fit and torque without slippage; cushion-grip handle for greater comfort; premium chrome-plated for smooth feel and corrosion resistance; internal flanges inside handle provide solid, twist-resistant blade anchor; special heat-treated shafts for longer life; "Tip-Ident" quickly identifies the screwdriver type and tip orientation. Tip is precision-machined to provide better fit and torque without slippage; cushion-grip handle for greater comfort; premium chrome-plated for smooth feel and corrosion resistance; internal flanges inside handle provide solid, twist-resistant blade anchor; special heat-treated shafts for longer life; "Tip-Ident" quickly identifies the screwdriver type and tip orientation.